This simple recipe makes for fun classroom treats & I had fun meeting up with Megan to make it and share! Fold the whipped topping, vanilla yogurt, pineapple, coconut milk and vanilla extract together. Whipped Topping Trade: Experiment replacing the whipped topping with Greek vanilla yogurt like the Cabot brand. 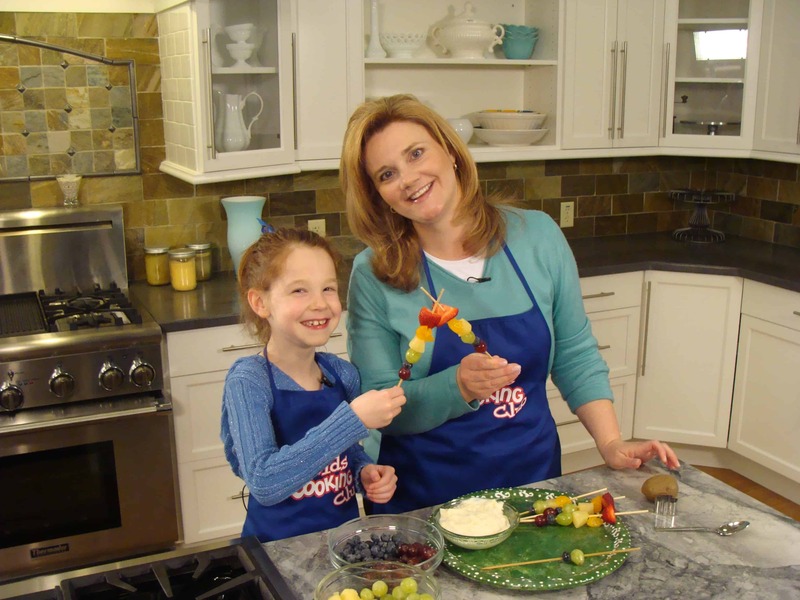 Rainbow Fruit Kabobs: At the Price Chopper Kids Cooking Club we created rainbow fruit kabobs by using skewers found at Price Chopper filled with strawberries, purple grapes, blueberries, green grapes, pineapple and mandarin oranges. And of course, there are other fruit substitutions that can be used to fit in with the colorful fun that this activity offers. Looks like a simple dip that will encourage kids to eat fruit which is awesome. Will have to try it with my bunch. So simple, but so much fun!!! It’s fruit salad on a stick :)…. Fruit kebobs are a great idea! Always something fun and yummy happening in your kitchen, Jodie! 😉 Thanks for sharing!! THANK you!!! 🙂 So appreciate your hosting…. What a fun and tasty way to get the kids to eat fruit! Thank you so much for sharing with Saturday Spotlight. Have a great week and come back soon! My kids love fruit time. I am definitely going to have to make kabobs for them. 🙂 And, I’m sure they’ll love the rainbows…. Have a GREAT spring! These would be great for parties too. Great! DEFINITELY!!! Have a great week….